Gratis NOLA! 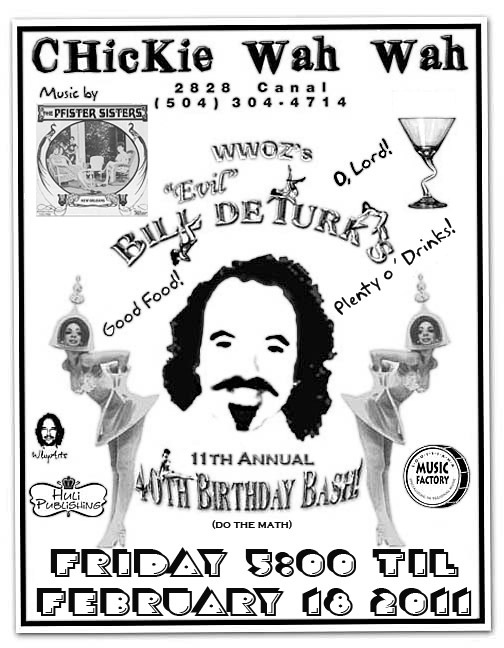 : Bill deTurk's 11th Annual 40th Birthday Bash Tonite!!! 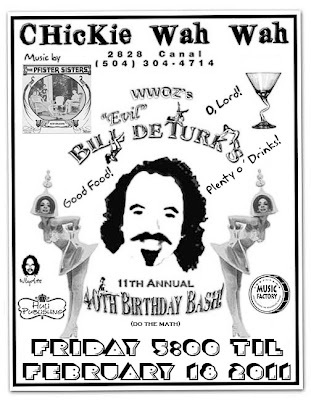 Bill deTurk's 11th Annual 40th Birthday Bash Tonite!!! I may be a little biased everybody, but as far I'm concerned there's only one amazing thing going on tonight....and that's Bill deTurk's 11th Annual 40th Birthday Bash at Chickie Wah Wah (2828 Canal St.) at 5:00 pm with Pfister Sisters!!! And be sure to stay on for Paul Sanchez and Shamar Allen - it's gonna be a fun nite! Check out the WWOZ Livewire! And tune into 90.7 FM and http://www.wwoz.org/ from 11 am to 2:00 pm for the incredible Louisiana Music Party with my hubby Bill deTurk!!! See you later!